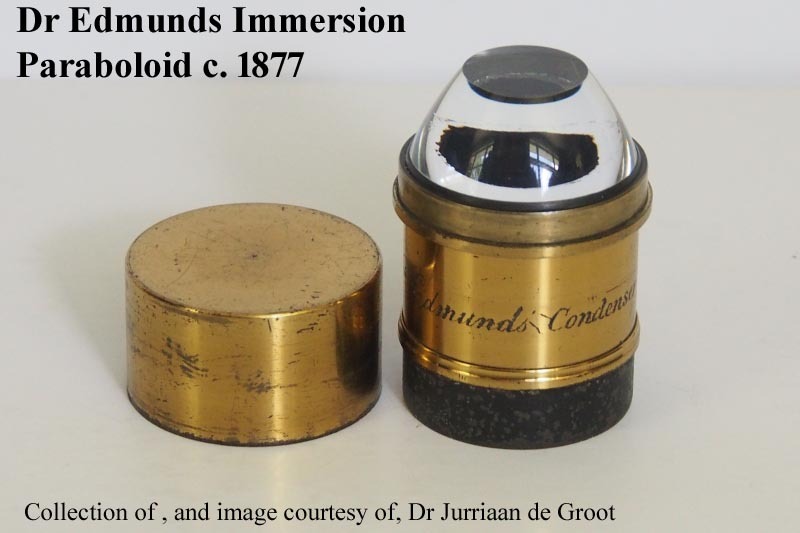 As the resolving power of microscopes improved in the second quarter of the nineteenth century, microscopists yearned for a greater ability to discern the fine details of objects seen under the microscope. From the time of Hooke, and Van Leeuwenhoek after him, it was noted that certain objects were more readily seen using oblique illumination which allowed mainly oblique light to reach the specimen, and causing the background to remain mostly black while the objects being studied were visible by their reflection of the oblique lighting. Among the first to report on a substage method of oblique illumination was the Rev. J. B. Reade of Cambridge as reported in the book 'Micrographia' authored by Pritchard and Goring in 1837. This is next mentioned in John Quekett's Practical Treatise on the Use of the Microscope of 1848, pages 178-9. As time went on, various devices were developed to improve the ease and degree of oblique lighting. 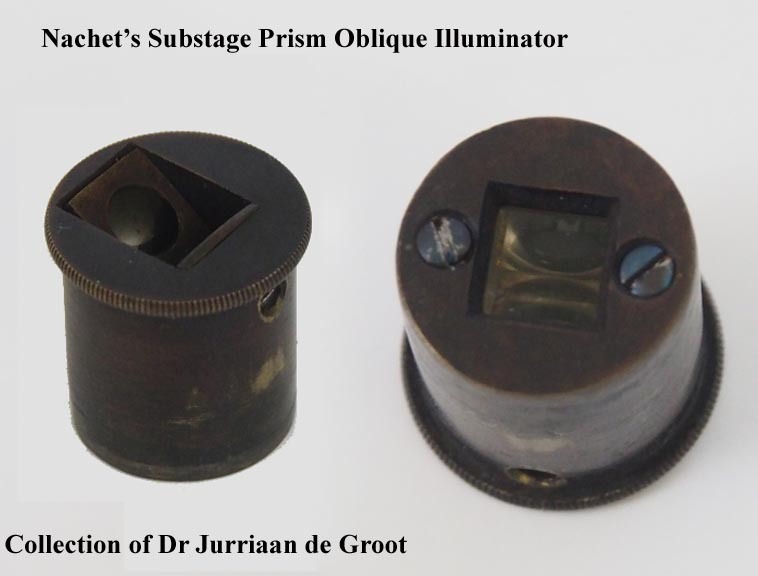 One of the most common, at least until the middle of the nineteenth century, was the prism illuminator, invented by Amici and a variation of which was made by Nachet. The Amici Lenticular illuminator is a modified prism which is adjusted while under the stage to provide optimal oblique lighting. Although better methods of dark ground illumination were developed starting in the middle of the nineteenth century, the Amici Lenticular Illuminator continued to be recommended even to the end of that century. 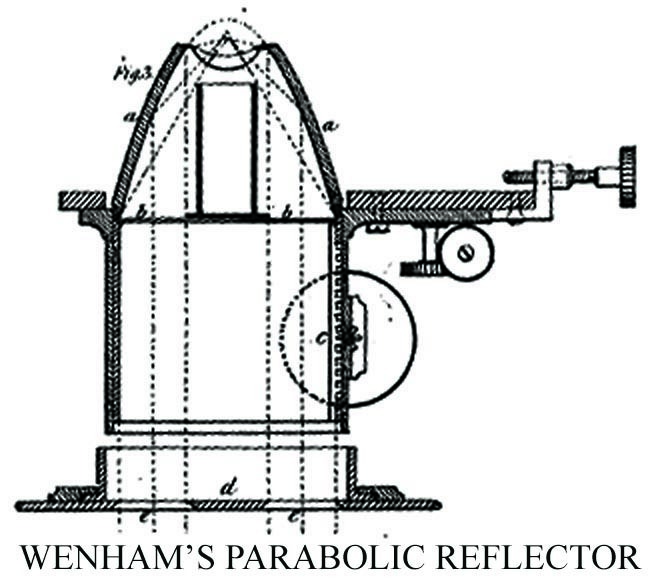 In the early 1850's Francis Wenham theorized that a better form of oblique illumination would encircle the specimen from all sides and he devised his 'Parabolic Reflector'. The parabolic reflector used an internal light path traveling off a reflector of speculum metal; the fact that this is a mirrored surface made it intrinsically achromatic. 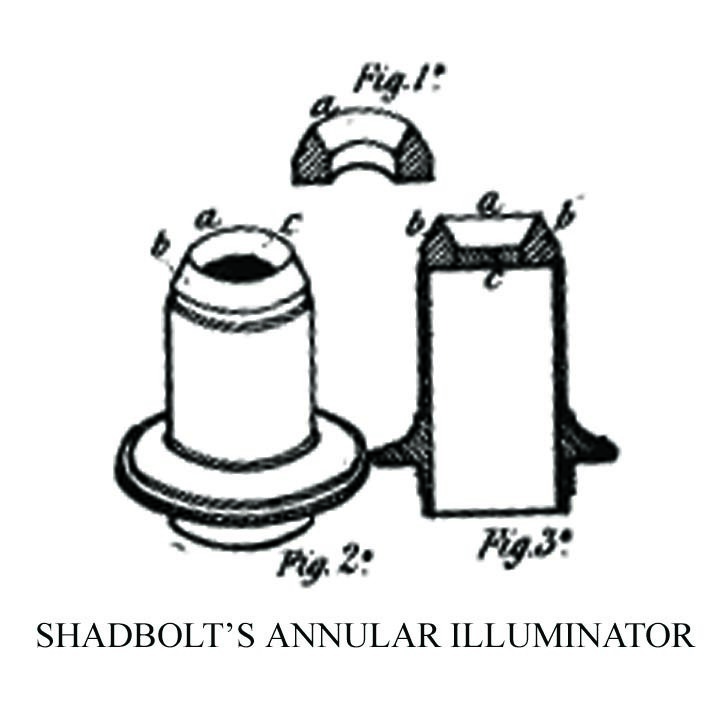 This was quickly followed by Shadbolt's 'Annular Illuminator' which used internal reflection inside a ring of glass of roughly triangular cross section surrounding an opaque central area. 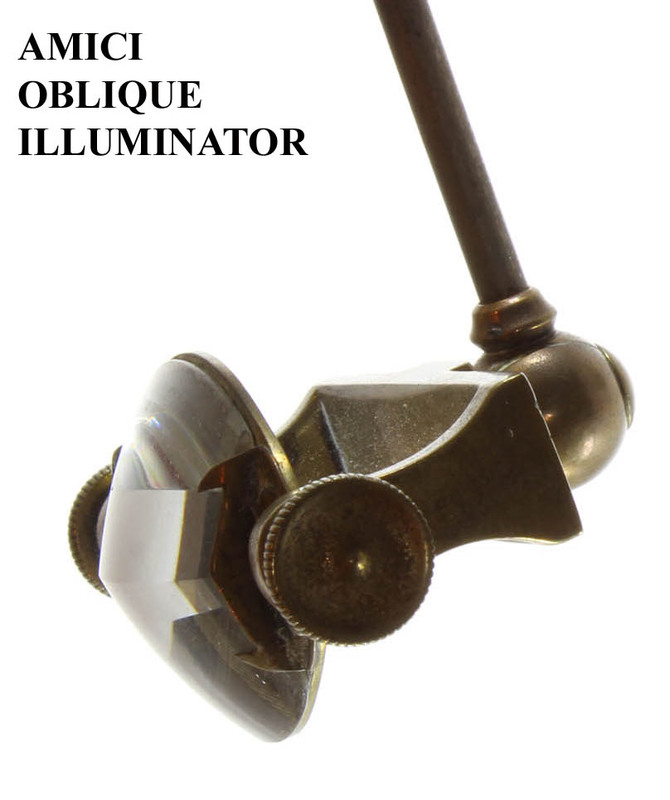 This type of illuminator, though very effective, and capable of concentrating more light upon the specimen, is limited to use with one focal length, hence the expensive proposition of having a different one for each objective. But Wenham's speculum reflector would also have been expensive and difficult to make. 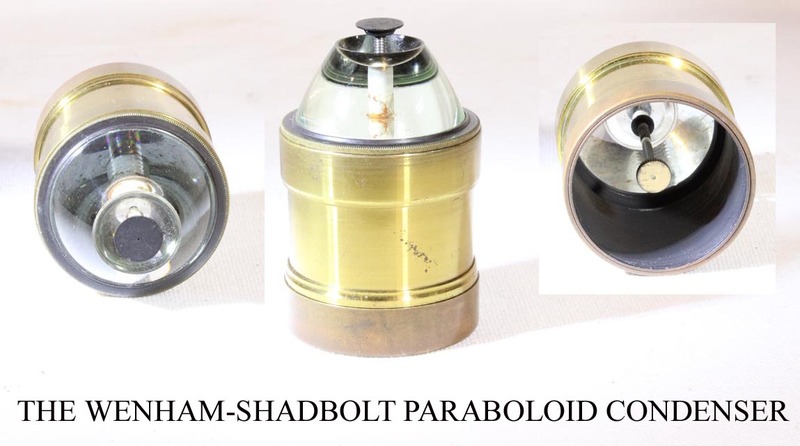 Subsequently, a hybrid device, commonly known as a 'Wenham Parabolic Illuminator,' 'Wenham Paraboloid' or more properly the Wenham-Shadbolt illuminator, uses a parabolic glass ring surrounding an adjustable center stop that can be moved up or down to accommodate objectives of differing apertures. The stop is moved down deeper inside the paraboloid for low power objectives, and close to the to the top for powers as high as a 1/4 inch focal length (25 X with 160 mm tube length) objective. This latter device was extremely popular and was used for many decades. It makes use of internal reflection of the parabolic glass, and is a far easier piece of equipment to make. Its parabolic shape reduces much aberration. In the 1880's, many microscopists again became obsessed with oblique illumination and to this end, systems built into the substage were invented. Although the swinging substage mirror had been invented many years earlier*, the axis of rotation was below the stage and therefore required adjustment with each change of the objective and its rotation did not center on the object. A better system was to make the axis of rotation even with the specimen. Perhaps the first to do this was Joseph Zentmeyer, who patented his idea in 1876. Indeed his idea really took off, and Zentmeyer's improvement in the swinging substage was incorporated not only into American stands, but also into those of many British makers, most notably Ross with the Ross-Zentmeyer Stands made in several different sizes and the ultimate 'Wenham-Ross Radial' Microscope. 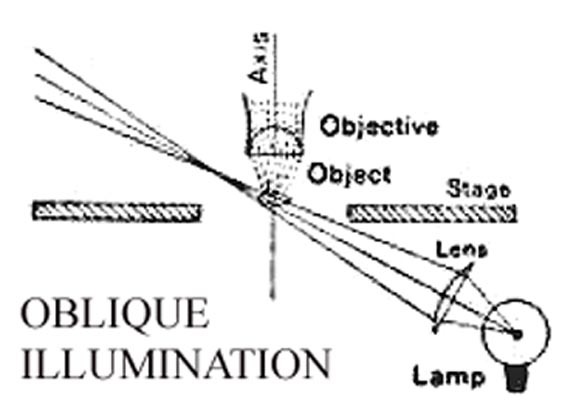 As Abbe's work on optimal illumination became known, the idea of improving resolution by using oblique illumination became an unsupported idea, and these extreme designs were abandoned in favor of more scientifically grounded principals which centered on improving condensers, and through the use of oil immersion. One of the earliest to design an immersion paraboloid for practical use was Dr James Edmunds in 1877. With the new knowledge came the development of better dark ground condensers for higher powers. These condensers still make use of a curved light path, usually either paraboloid or cardioid, though other forms also exist. These more modern dark ground condensers for high power all require an oil interface to the slide to function properly. The light path usually involves a paraboloid or cardioid course. These condensers are still used today. One important principal involved in high power Dark field work with these condensers, is the fact that the numerical aperture of the condenser must exceed that of the objective. To accomplish this at high power often requires reducing the numerical aperture of the objective. This can be accomplished by the use of a 'Funnel Stop' which fits inside the objective, or in the case of high n.a. 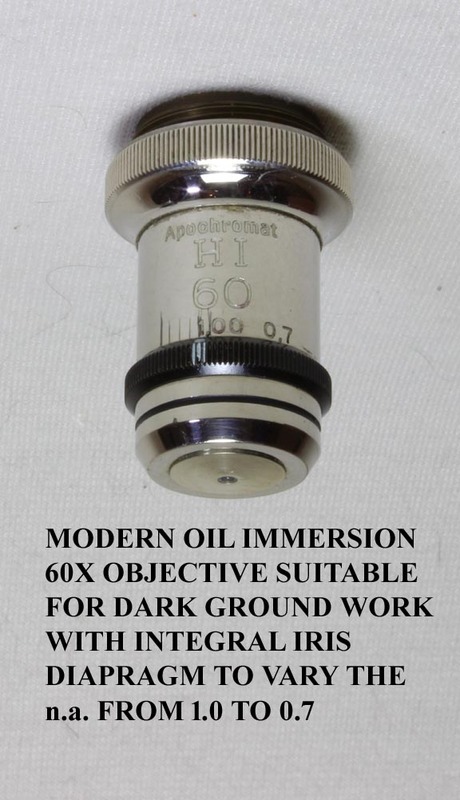 modern objectives, an iris diaphragm built-in to the oil immersion objectives. 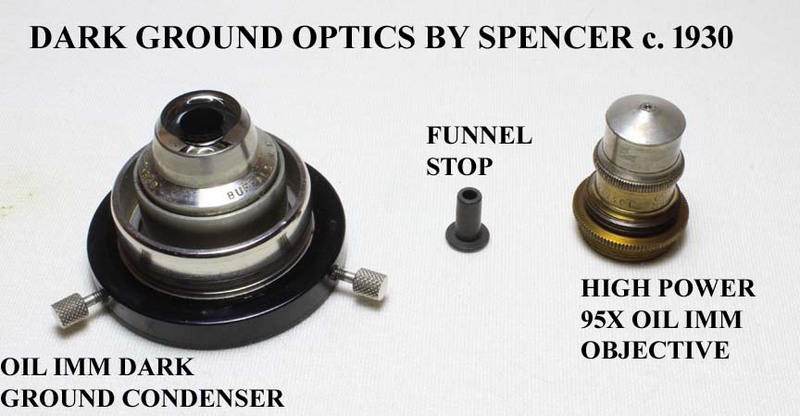 The kit by Spencer to the left illustrates the funnel stop while an example of the objective with built-in iris is shown to the right. 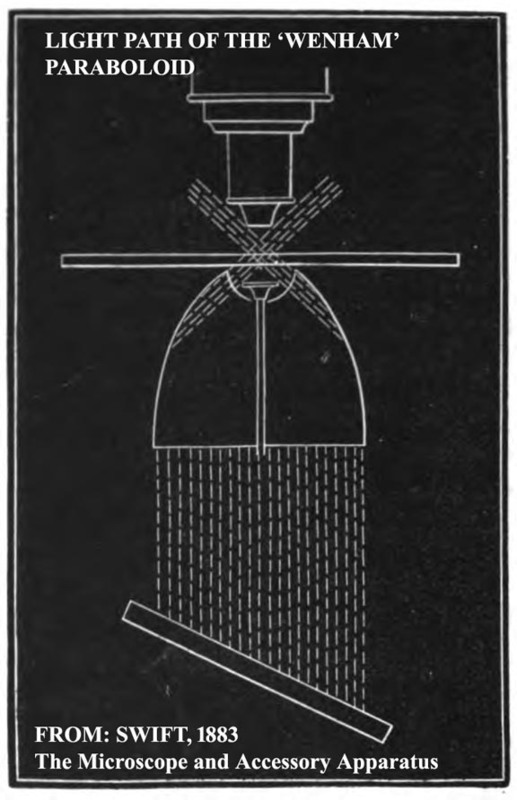 Another example of a dark ground immersion condenser is the Watson 'Holos Immersion Paraboloid'. For a detailed review of the various forms of darkground illumination now in use, the reader is referred to the superb review on the Olympus website. Early on, for lower power dark field work, a 'spot lens' condenser was used but in later condensers, simple 'stops,' a set of which is shown to the right, can be used which fit into the filter holder at the bottom of the condenser. This kind of fitting (stops) can be found with many microscopes in this collection that date from the late 19th to the mid-20th century. These stops are still made and sold today. 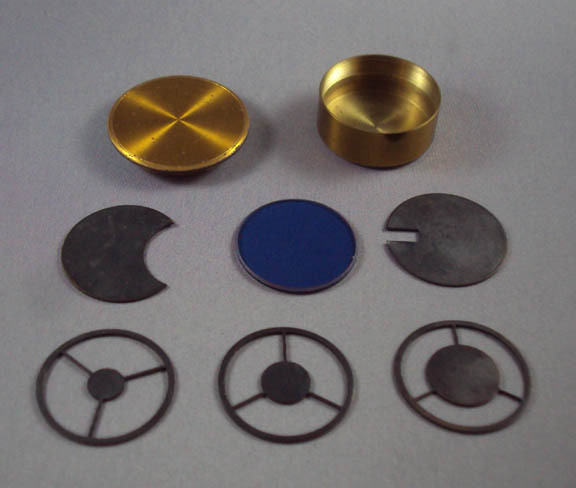 The set shown to the right includes not only inserts for dark ground (the three on the bottom), but also a couple of inserts for oblique lighting. It should be remembered that not only was Francis Wenham the first to suggest a paraboloid illuminator, he was also the first to suggest, (in 1856) the use of immersion fluid for optimal use of these at high power. Conrady, A.E. : 1912. Resolution with Dark Ground Illumination. JQMC 11:475-80. Edmunds, James: 1877. On a new immersion paraboloid illuminator. JQMC V:17-21. Gage, S.H. : 1920. Modern Dark Field Microscopy and the History of its Development. Trans Am Micros Soc. XXXIX:95-141. Goring and Pritchard: 1837. Micrographia...Whittaker & Co. London. Lister, Joseph Jackson: 1830. On some properties in achromatic object-glasses applicable to the improvement of the microscope. Philos Trans Roy Soc 120: 187-200. Quekett, John: 1848. A Practical treatise on the use of the microscope... First Ed. 178-179. Reade, Rev J.B.: 1837. On a new method of illuminating microscopic objects; pages 227-31 of Micrographia by Goring and Pritchard as quoted above. Shadbolt, George: 1851. Observations upon oblique illumination with a description of the author's Sphaero-annular condenser. Trans Micro Soc Lond. III: 132-133. Stephenson, J.W. : 1879. A catoptric immersion illuminator. 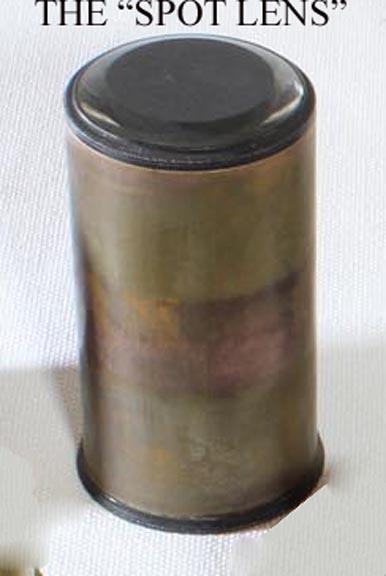 JRMS II;36-37. This design was the basis for many modern dark ground condensers that depend upon a silvered central part. Wenham, Francis H.: 1850. On the illumination of transparent microscopic objects on a new principal. Trans Micro Soc Lond III:83-90. *Examples of swinging substage microscopes in this collection from about 1865 include the Zentmayer Grand American and the Scottish stand by Angus Henderson. I am certain there are earlier examples as well.